Scene from across the road at today's weekly Monday market - another sunny day with lots of people out as it's a bank holiday, but fewer of the usual stalls. 2. I'm gaining a pair of shorts from my daughter's most recent dressmaking experiments - I did pay for the fabric but they weren't meant for me. 3 My daughter was well enough to be dressmaking today. Thank you for looking and your comments and faves. You're all wonderful, supportive people. I prefer to spend time looking at your pictures rather than thanking your individually below. There’s so much going on here, the conversations, the sign and then the man adjusting his hat. Great candid... I like it in B&W. Very cool slice of life. Fun street shot. I can feel the warmth and hear the conversation. 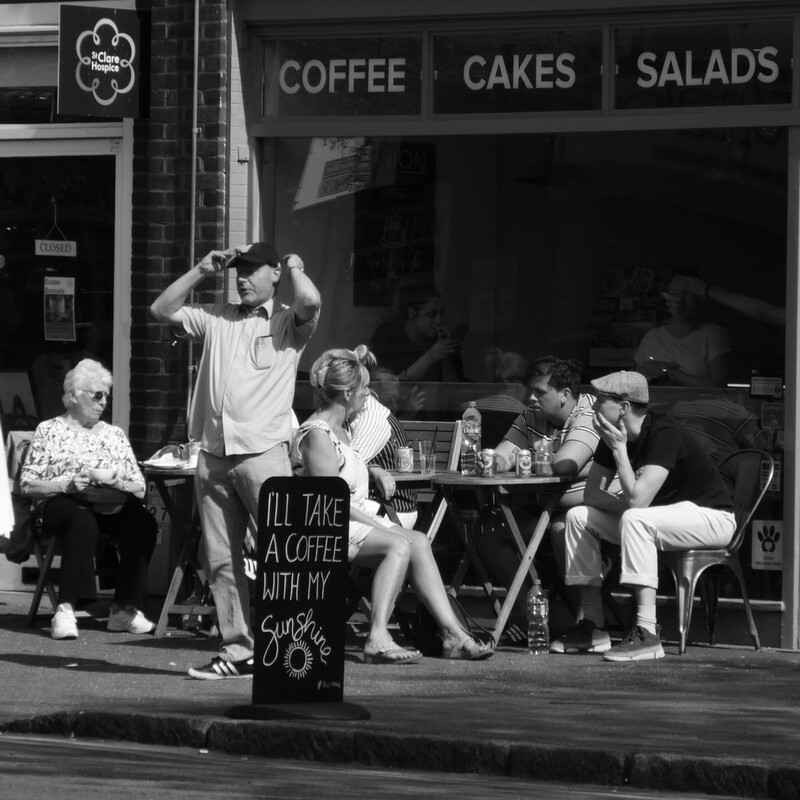 Fun street scene- love the group deep in conversation and the fellow adjusting his hat- great capture of a moment in time. I think this can qualify as Accidental Renaissance! Although only one standing, they looked posed and a bit dramatic. ☺ and "There’s so much going on here", just like accidental renaissance. Great slice of life shot. Slice of life...that's what came to me as I saw this candid shot.